Restaurant reviewer Joy Manning keeps the pounds off with a tell-all blog and a semi-vegetarian diet at home—the subject of her new cookbook, Almost Meatless. Still, the threat of public embarrassment isn’t Manning’s most effective tactic for controlling her weight: Instead, her strategy is to work out—a lot—and balance rich restaurant meals with light dishes at home that contain just a little meat. Manning, along with cowriter Tara Mataraza Desmond, has turned those recipes into a terrific cookbook, the new Almost Meatless. Her summery BLT bread salad is a tumble of cherry tomatoes, butter lettuce and homemade croutons, with a bit of smoky bacon for substance. 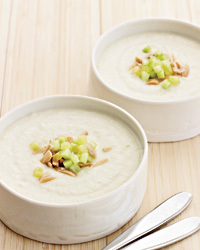 She keeps her tangy white gazpacho completely vegetarian, but it’s deceptively creamy: Almonds and cauliflower give the soup a silky texture. A bonus to her almost-vegetarian approach: “What’s good for you and good for the environment tend to go together,” she says.